Q1. In the LAN for a small office, some user devices connect to the LAN using a cable, while others connect using wireless technology (and no cable). Which of the following is true regarding the use of Ethernet in this LAN? a. Only the devices that use cables are using Ethernet. b. Only the devices that use wireless are using Ethernet. c. Both the devices using cables and those using wireless are using Ethernet. d. None of the devices are using Ethernet. Answer: A. The IEEE defines Ethernet LAN standards, with standard names that begin with 802.3, all of which happen to use cabling. The IEEE also defines wireless LAN standards, with standard names that begin with 802.11, which are separate standards from Ethernet. Q2. Which of the following Ethernet standards defines Gigabit Ethernet over UTP cabling? d. None of the other answers is correct. Answer: D. The number before the word “BASE” defines the speed, in megabits per second (Mbps). 1000 Mbps equals 1 gigabit per second (1 Gbps). The “T” in the suffix implies twisted-pair or UTP cabling, so 1000BASE-T is the UTP-based Gigabit Ethernet standard name. Q3. Which of the following is true about Ethernet crossover cables for Fast Ethernet? a. Pins 1 and 2 are reversed on the other end of the cable. b. Pins 1 and 2 on one end of the cable connect to pins 3 and 6 on the other end of the cable. c. Pins 1 and 2 on one end of the cable connect to pins 3 and 4 on the other end of the cable. d. The cable can be up to 1000 meters long to cross over between buildings. Answer: B. Crossover cables cross the wire at one node’s transmit pin pair to the different pins used as the receive pins on the other device. For 10- and 100-Mbps Ethernet, the specific crossover cable wiring connects the pair at pins 1 and 2 on each end of the cable to pins 3 and 6 on the other end of the cable, respectively. 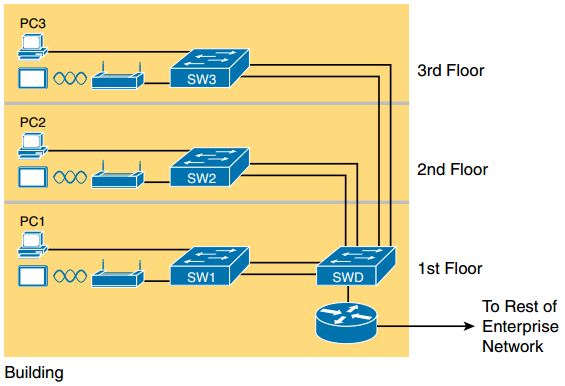 Answer: B, D, and E. Routers, wireless access point Ethernet ports, and PC NICs all send using pins 1 and 2, whereas hubs and LAN switches transmit on pins 3 and 6. Straightthrough cables connect devices that use opposite pin pairs for sending, because the cable does not need to cross the pairs. Q5. Which of the following is true about the CSMA/CD algorithm? a. The algorithm never allows collisions to occur. b. Collisions can happen, but the algorithm defines how the computers should notice a collision and how to recover. c. The algorithm works with only two devices on the same Ethernet. Answer: B. NICs (and switch ports) use the carrier sense multiple access with collision detection (CSMA/CD) algorithm to implement half-duplex logic. While CSMA/CD attempts to avoid collisions, it also notices when collisions do occur, with rules about how the Ethernet nodes should stop sending, wait, and try again later. Q6. Which of the following is true about the Ethernet FCS field? a. Ethernet uses FCS for error recovery. b. It is 2 bytes long. c. It resides in the Ethernet trailer, not the Ethernet header. d. It is used for encryption. Answer: C. The 4-byte Ethernet FCS field, found in the Ethernet trailer, allows the receiving node to see what the sending node computed with a math formula that is a key part of the error-detection process. Note that Ethernet defines the process of detecting errors (error detection), but not error recovery. a. Each manufacturer puts a unique OUI code into the first 2 bytes of the address. b. Each manufacturer puts a unique OUI code into the first 3 bytes of the address. c. Each manufacturer puts a unique OUI code into the first half of the address. d. The part of the address that holds this manufacturer’s code is called the MAC. e. The part of the address that holds this manufacturer’s code is called the OUI. f. The part of the address that holds this manufacturer’s code has no specific name. Answer: B, C, and E. The preassigned universal MAC address, given to each Ethernet port when manufactured, breaks the address into two 3-byte halves. The first half is called the organizationally unique identifier (OUI), which the IEEE assigns to the company that builds the product as a unique hex number only to be used by that company. Answer: C and D. Ethernet supports unicast addresses, which identify a single Ethernet node, and group addresses, which can be used to send one frame to multiple Ethernet nodes. The two types of group addresses are the broadcast address and multicast addresses.